Wolf Alice were honored with the 2018 Mercury Music Prize on Thursday for their sophomore album, “Visions of a Life”. The reward is given every year to the best album in the United Kingdom by a British or Irish act, and includes a £25,000 prize. Noel Gallagher, Arctic Monkeys and Lily Allen were also nominated. They also beat bookies’ favorite Nadine Shah, who was tipped to win with her album Holiday Destination, which recounts her experiences as a second-generation immigrant. “The first label meeting we ever had, we walked into a room, and the geezer said, ‘You don’t look like a band at all. What are you? What are you supposed to be? All your songs sound different. You don’t look like each other,'” bassist Theo Ellis said at the ceremony at London’s Hammersmith Apollo. “We never really figured it out, but here we are,” he continued. The band’s debut album, My Love Is Cool, was nominated for the Mercury Prize in 2015. Wolf Alice have just finished up an Australian tour on the back of second album ‘Visions Of A Life’, and have now shared a new video for ‘Sadboy’. But the four-piece seem to be getting in the spirit of Haloween in the new clip: it sees the band head to an extremely house party, and sees Ellie Rowsell getting into an extreme spot of bother. Wolf Alice are set to play a host of summer festivals this year, including Reading & Leeds, Latitude, TRNSMT and more. They’re also set to support Foo Fighters on a handful of stadium dates. In what was a particularly strong line-up on the long-running BBC show, London four-piece Wolf Alice ranked higher than the likes of King Krule, SZA, Grizzly Bear and Paul Heaton + Jacqui Abbott who also featured. To kick things off, Wolf Alice rolled into ‘Beautifully Unconventional’ before playing ‘Don’t Delete The Kisses’ to close the show. It’s a new Wolf Alice track from the upcoming album due to be released late september. The band have shared ’Don’t Delete The Kisses’, the second offering from upcoming album “Visions Of A Life” and we’re here to tell you that it’s an absolute peach. The track follows the earlier first song “Yuk Foo” in previewing the follow-up to 2015 debut “My Love Is Cool” due out on 29th September via Dirty Hit. The band start an intimate US tour in Chicago tonight (5th July). The run extends through July, before a UK and European run in the Autumn. They’ve also shared the artwork for the new album ‘Visions Of A Life’. 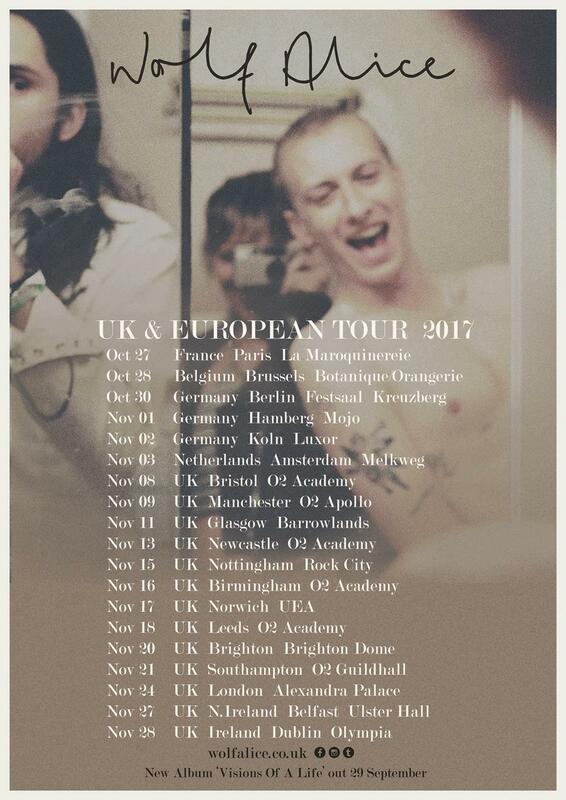 Listen to ‘Don’t Delete The Kisses’ below, view the tour dates and get nice and properly excited for ‘Visions Of A Life’!. ‘Don’t Delete The Kisses’ is, in short, incredible. Its verses are like a continuation of ‘The Wonderwhy’, in that frontwoman Ellie Rowsell softly speaks her words instead of singing them. “I’m typing you a message that I know I’ll never send/Rewriting old excuses, delete the kisses at the end,” she sighs at one point, a piece of ultra relatable poetry for anyone navigating love and lust and trying to play it cool with your crush. Ok we have been waiting for this day for a while now but it’s here finally and we are able to tell you that we have a new album!!!! ‘Visions Of A Life’ will be available for you on the 29th of September. We are immensely proud of this album and it will give us great pleasure to share it with you. Oh and we hope u enjoy “Yuk Foo”, you can listen here today , the band have also annouced dates for a european tour , so see you all in the pit for that one hehehehehehe. After an incredible two years touring ‘My Love Is Cool’ we can’t wait to come see you all again and enjoy these new tunes together. Wolf Alice stopped by BBC Radio 1’s Live Lounge this morning, and they only brought a bloody entourage of string-instrument wielding sidekicks with ‘em! As well as a cello-ified version of their track ‘Freazy,’ they also covered Alt-J’s ode to Luc Besson’s film Léon. Wolf Alice perform “You’re A Germ” on Later… with Jools Holland, BBC Two (20th October) Duran Duran and Little Simz also performed on the BBC Two music variety show), were among the musical guests on Later… With Jools Holland on Tuesday night. The north London band performed ‘You’re a Germ’ from their Mercury Prize-nominated debut album ‘My Love Is Cool’. It’s been an exciting 12 months for Wolf Alice since they messed with many a young mind from the John Peel stage at last year’s Glastonbury, with an assault on the senses that was bookended by a blazing cover of Chris Isaak’s Wicked Game, and singer Ellie Roswell’s psychedelic pink dress. Having built up a formidable fanbase based on a pair of fine EPs and a lot of hard gigging, they proved to be a worthy addition to the BBC’s Sound of 2015 longlist. 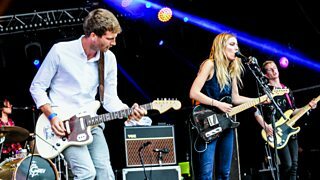 Wolf Alice’s set on the John Peel stage at Glastonbury Festival 2014. Ahead of their UK tour next week, Wolf Alice have unveiled a new track – ‘Baby Ain’t Made Of China’ – which is the B-side to current single ‘You’re A Germ’ which is out on October 30th via Dirty Hit Records, but also offered as a free download via Soundcloud. The track was recorded in Santa Monica, California and co-produced by Charles Scott (who releases music under the name of Scott Sinjin) during the band’s recent U.S tour. n what has been a busy week, Wolf Alice covered One Direction’s ‘Steal My Girl ‘recently for Radio One’s Live Lounge on Monday, before going on to collect the award for Breakthrough Of The Year at AIM (The Association of Independent Music Awards) award ceremony the following night. It’s been an exciting 12 months for Wolf Alice since they messed with many a young mind from the John Peel stage at last year’s Glastonbury, with an assault on the senses that was bookended by a blazing cover of Chris Isaak’s Wicked Game, and singer Ellie’s psychedelic pink dress. Having built up a formidable fanbase based on a pair of fine EPs and a lot of hard gigging, they proved to be a worthy addition to the BBC’s Sound of 2015 longlist. Then there was the piledriving single Giant Peach – a former Zane Lowe Hottest Record in the World – which boasted the kind of riff that could level Stonehenge. And of course they finished and released their debut album My Love Is Cool, giving fans at this year’s festival roughly three days to learn the proper versions of all the songs they’ll have been howling along to at gigs. Watch ‘em roar!